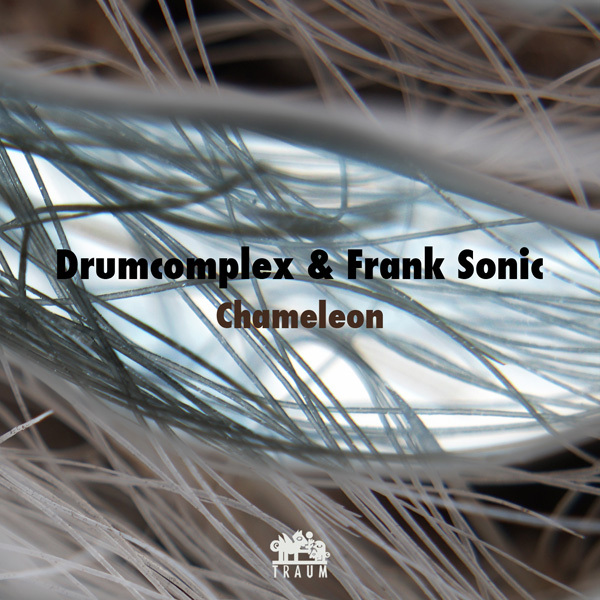 Drumcomplex & Frank Sonic – Chameleon EP – Traum V213 Drumcomplex & Frank Sonic – Chameleon EP – Traum V213 Drumcomplex is know to many for his releases on MB Elektronics, Phobiq, Different is Different Records, INTEC and Complexed. Now he has teamed up with Frank Sonic for a special release of theirs for Traum. The opening track “Chameleon” is an absolute slammer with sequences running up and down the stream creating new synapses in your nervous system each split second. The analogue strength is breathtaking and that does not cover only the powerful beat but can be heard all through the track. Welcome to the pleasure dome of hedonistic melodic rave. We were waiting for this one. This track will make you happy. “Lucky Seven” shows the flip side of the coin, it aims less at peak time moments but runs along and while it does it seems to pick up ideas. So that is wanderlust from a different perspective as you will notice. This is for sure a weird and retarded and twisted world they have painted here and goes beyond from what we have heard lately. As Drumcomplex told us himself: „it is so bent, something Sven Väth would play in his sets“. A fantastic tale that fuses MUZAK with TECHNO. The last track of the release “Ikaruna” is another story of its own. Genre wise it is hard to match… rather of the genre defying trax that pop up from time to time and that find fans from different areas. It is a spirit catcher that operates with Indian sounds and percussion to say the least. You will have to hear for yourself.